Magnus Carlsen has made his late spurts legendary as he won yet another tournament in the late stages. In one of the strongest tournaments ever (four 2800s), he was near the top the entire tournament, but a last-round win over Hikaru Nakamura helped him to claim the crown on tiebreaks over Levon Aronian. Aronian had taken the lead with a dramatic win over Peter Svidler in the penultimate round and was poised to take the title. In the final round, a big showdown between Carlsen and Nakamura took place. The two players have appeared together in the headlines since Nakamura had made strides and broke into the top ten. The recent development that Nakamura had begun working with Kasparov combined with Carlsen’s reaction made this a highly anticipated match. While Carlsen is skeptical of the alliance, this match may have been a defining point in this new rivalry. Carlsen would play 50…f4! as a nice lever to pry open a path to white’s barricade. Carlsen played aggressively with 15…g5 16.Be3 g4 winning a pawn after 17.Nd4 Nxe5. 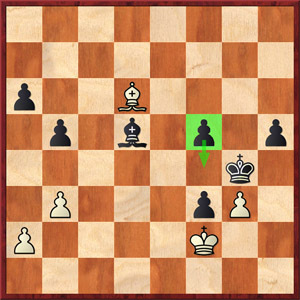 It appeared that black’s activity compensated for his kingside weakness. Carlsen managed to get all the pieces traded down to an opposite-colored bishop and after Nakamura sacrificed another pawn to create a blockade, it appeared there may be drawing chances. Perhaps, the American make a mistake in setting up his barricade (is h4 a better try? 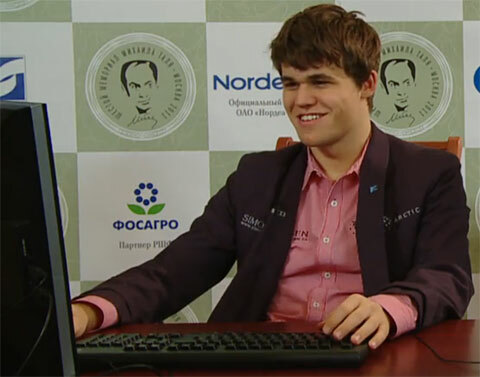 ), but Carlsen showed good form in the ending and 50…f4! was certainly a path to victory. In the end, Carlsen would raid white queenside pawns and then push through on either side of the board.